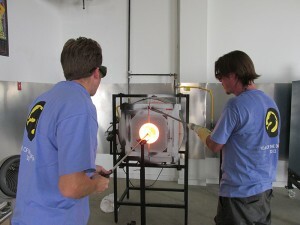 Come join us and learn the art of Glass Blowing! 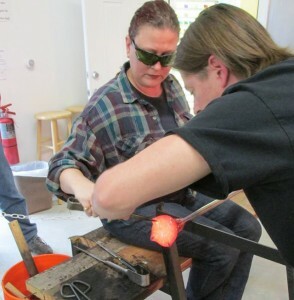 Our experienced artists will take you through basic techniques individually and with a team, to further develop your hot glass skills. Learn to make a glass bubble, ornament, paper weight and much more! Click the links below to view all of our exclusive classes. Students will choose colors and sit at the bench with the instructing glass blower. You will assist in creating your project by applying color, blowing the piece, tweezing/twisting, and opening a cup or vessel! This course introduces students to basic mouth blown techniques working hands-on, either individually or with a team to create one of a kind projects. 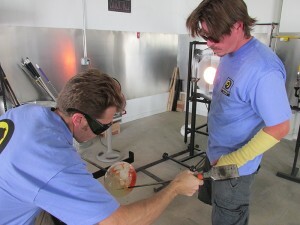 This course teaches students basic glass blowing techniques by working together with a team to develop their skills. 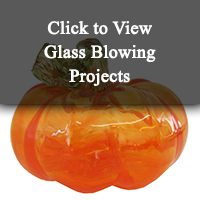 Students will learn what it takes to make a glass cylinder with hands on demonstrations every class. This next level course takes students past the basic Intro. 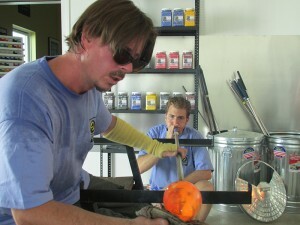 to Glass Blowing techniques by working individually and with a team to explore more complex shapes. Students will start off making a glass cylinder and then branch out to learn vases, bowls, and long neck bottles!